Nils Styger is a natural born citizen of Genosha and son of the two thousand year old dimension-hopping mutant, Azazel. [Uncanny X-Men (1st series) #402, 431] One of the Neyaphem, a group of mutants banished from our reality during Biblical times, Azazel used his natural teleporting power to return to our reality and father many children by different women, including Nils. Nils’ early life remains largely unknown until he tested positive for the mutant gene and, like all mutant citizens of Genosha, underwent the Mutate bonding process and was forced to become a slave to his own people. After the X-Men toppled the Genoshan leaders, a new egalitarian government failed to stave off civil war between human and Mutates, and to make matters worse the Legacy Virus ran rampant through the malnourished Mutate population. 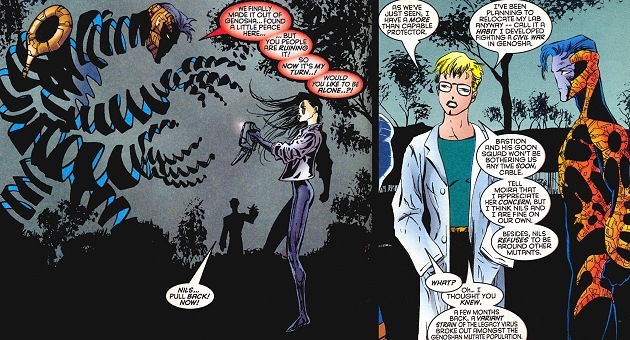 Nils was one of the Mutates infected with the Legacy Virus. In order to avoid infecting any of his fellow mutants, Nils left Genosha and came to America to work with another Genoshan expatriate, the human scientist Renee Majcomb. Majcomb was a member of Professor Xavier’s Mutant Underground, corresponding with other scientists in an effort to find a cure for the Legacy virus. Nils volunteered to become her protector in order to contribute to the cause. They relocated to an isolated laboratory off the Louisiana bayou so that Renee could carry out her work in peace. Nils and Renee could not remain hidden forever, though, and were assaulted by the First Strike team, covert agents of the anti-mutant organization known as Operation: Zero Tolerance. The bigots were completely unprepared for Nils’ void and he easily overwhelmed one of their number before Cable and reinforcements from Charles Xavier arrived. Directionless again, Abyss wandered the world for a time until he felt an irresistible compulsion to travel to the Caribbean. He found himself on the Isla Del Demonas with the X-Men’s Nightcrawler and many other mutants possessing teleportation or displacement powers. Caught up in a powerful trance, the mutants arranged themselves in formation and combined their powers, casting open a vast inter-dimensional portal. The X-Men arrived on the scene and attempted to disrupt the process, only for all the participants to be swept up into the portal as it closed. Nils and Nightcrawler were the only portal-mutants who survived the transition and their minds were now clear of any foreign influence. They were all met by the ruler of the hellish dimension they landed in, Azazel of the Neyaphim. Startlingly, Azazel identified himself as the long-absent father of Abyss, Nightcrawler and the mutant compelled into guarding of the portal, Kiwi Black. Nils’ father explained that he and his Neyaphim, a band of demonic-looking mutants, had been banished into this Brimstone Dimension thousands of years ago by an angelic subspecies of mutants called Cheyarafim, and had been trying to return ever since. Azazel’s personal teleporting powers enabled him alone to return to Earth for a brief time periods, and he fathered a horde of children around the globe, hoping to one day use their inherited teleporting powers in conjunction with his own to pierce the void completely and allow the Neyaphim to come home. 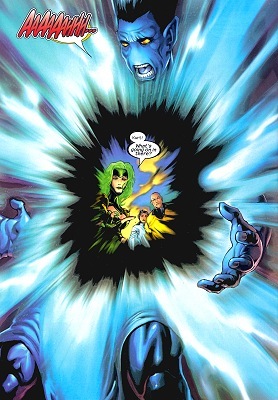 Indeed, Abyss’s dimensional void functioned in reverse in this Brimstone Dimension - opening up his chest cavity caused things long thought lost to the void to begin shooting out, such as a skateboard, his neighbor’s dog… and Mystique. Abyss spent some time at the mansion getting to know his new brothers, Nightcrawler and Kiwi Black, but eventually set out on his own once again. He was one of the countless mutants decimated by the Scarlet Witch’s power on M-Day, losing his mutant gifts. In time, Abyss met Elijah Cross and several other former mutants who organized into an X-Cell to find out what happened to their powers. 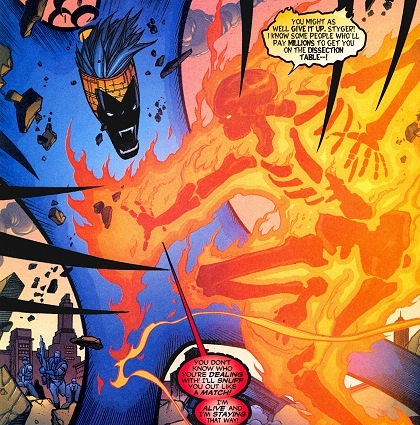 Believing that the Decimation was part of an anti-mutant conspiracy, the X-Cell began attacking government and military officials, demanding the return of their powers. They were supported by advanced technology provided for Cross by Josef Huber, the Isolationist, who wanted the X-Cell active and causing trouble for his own purposes. 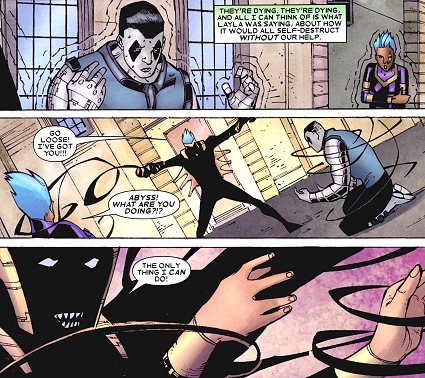 Abyss was outfitted with a suit of cybernetic metal coils that simulated the organic tendrils his body used to generate. X-Cell’s terrorist acts drew the attention of the Office of National Emergency, as well as the X-Factor Investigations agency operating in Mutant Town, New York. The plan had worked and the explosive effects of Abyss’ repowerment were frozen as long as he stayed in the Brimstone dimension. He, along with Fatale and Reaper, was stuck in the dimension for many months, unable to leave for fear of death. Their salvation came when a brilliant biologist by the name of Dr. Terrance Hoffman pulled them from the dimension and drained the dangerous energies within them. 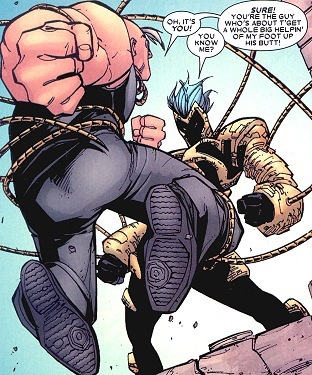 In the Age of Apocalypse, Abyss was the most recently chosen of Apocalypse’s Horsemen, replacing one called Bastion. His carefree attitude irritated some of Apocalypse’s more serious followers, but his dedication to mutant supremacy was unquestioned. This Abyss had cultivated his void as a psychic leech, feeding off of the emotions of flatscans he fed to the abyss. His respect for human life was so low that he likened them to sticks of gum that lost their flavor after his void overwhelmed their psyches and rendered them catatonic. 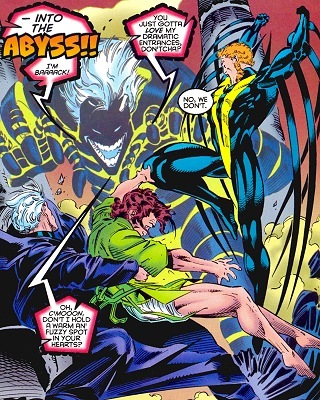 Abyss first presented himself to the X-Men when he attempted to stop the Great Human Exodus to Europe. Not one to start small, Abyss kidnapped a child to challenge Quicksilver, son of Magneto, in personal combat. Pietro temporarily overcame Abyss by shoving his undulating body into his dimensional void, forcing him inside-out. They clashed again in the Tabernacle of the Madri, where the X-Men’s ally Bishop was held prisoner. He confronted Quicksilver and Banshee, and goaded the elder X-Man with the fear he sensed inside of him. Banshee was spurred into action by Abyss’ taunts and flew straight into the Horseman’s void. He then unleashed a disruptive sonic cry that tore Abyss apart from the inside, disintegrating his unraveling form for good.